Joining Bart this month are Gaz from the My Mac Podcast, Lynda Gousha, and Nick Riley. 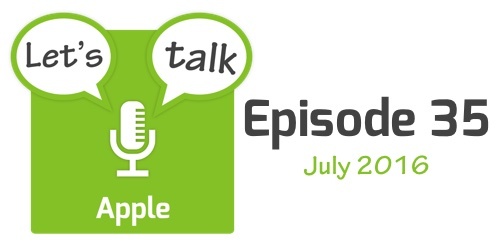 The show starts with a few follow-ups to some stories from June, before having a quick look at some notable numbers and Apple-related legal stories which broke in July. The four main stories are Apple’s Q3 2016 earnings call, Apple Watch’s place at the top of the J. D. Power Smart Watch Satisfaction survey, some staffing changes at Project Titan, and the sale of ARM to SoftBank. The show finishes with a quick rundown of some other shorter stories that made the news in July.